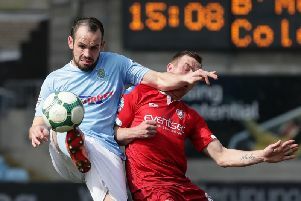 David Cushley hit a goal of the season contender to help blast Crusaders into the semi finals of the County Antrim Shield. The deadly Cushley struck four minutes into extra time to see off Gary Haveron’s Glentoran in a night that will not live long in the memory of the home fans. Teenager Brandon Doyle bagged a second to guarantee the Crues a last four place and, although Steven Gordon scored with the final kick of the game, it failed to paper over the cracks that suggests major surgery is still required on the east Belfast ream. Crues boss Stephen Baxter named a posse of his Under-20 side -- but they didn’t disappoint. Baxter also hailed the quality of Cushley’s strike. It was the home team who asked all the early questions, but with Nacho Novo and Alex Leu testing visiting goalkeeper Michael Dougherty. Baxter’s young braves grew into the game and an error from Nigel Birney, who swiped at a Salou Jallow cross but Marcio Soares’ control let him down. A piece of Novo magic on the left carved out a golden opportunity for Leu on 30 minutes, whose shot was hoofed off the line by Dale McCreery. With the game heading for extra time, Jonathan Smith missed a great chance from the home team before he brought a wonderful save from Dougherty with a stinging drive. But Cushley required only four minutes of extra time to shoot the Crues in front. He pounced on a knock down from Soares before lashing home a stunning drive from the edge of the box. He then capitalised on an mistake by Patrick Cafolla to set up Doyle for the second before Gordon bagged the consolation.